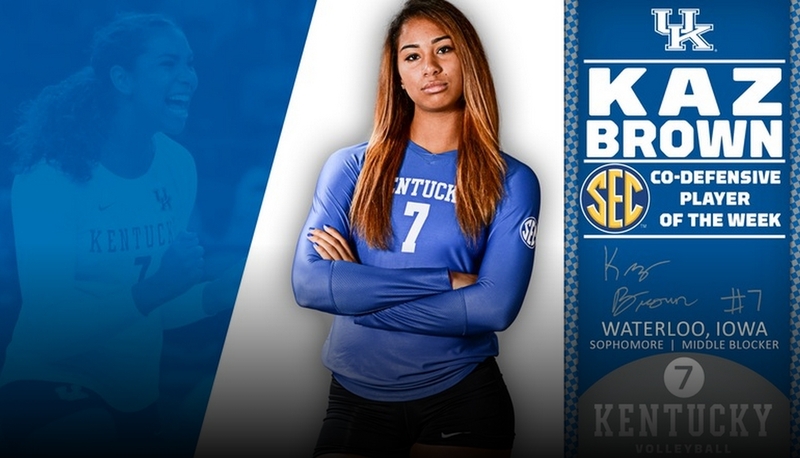 LEXINGTON, Ky. – The Southeastern Conference announced its weekly volleyball honors on Monday afternoon, with Kentucky sophomore Kaz Brown earning co-defensive player of the week. Brown led the Wildcats in back-to-back 3-1 wins, first on the road at Xavier on Friday night before pushing the team to victory against Louisville on Sunday. In a breakout season, Brown continued to impress last week, where she averaged 2.88 kills per set on a .283 hitting clip and had a staggering 2.62 blocks per set. The sophomore had two phenomenal outings during the week, first posting 13 kills and tying her then-career best eight blocks at Xavier before an unbelievable defensive outing against Louisville in which she had 10 kills and 13 blocks. Brown became the first UK middle to record a double-double in a match since 2007 with the 10-kill, 13-block performance against Louisville. Her 13 rejections also marked a new UK record for blocks the 25-point rally scoring era and a new career high, while her 11 block assists against the Cards set a new UK high for individual block assists in a four-set match during the rally-scoring era. Brown leads the team in total points (168.5), blocks (62) and hitting percentage (.344) this season while placing second on the team in kills (133) and kills per set (3.02). Kentucky’s Memorial Coliseum will play host to the NCAA Regionals Dec. 11-12. UK is one of four sites selected for the Sweet 16 and Elite Eight matchups with one team advancing to the Final Four in Omaha, Neb., from the Lexington Region. This marks the third time in five seasons Memorial Coliseum will host this premier volleyball event. For the latest on the Kentucky volleyball team, follow them on Twitter, Facebook and Instagram, and on the web at UKathletics.com.